Great for people whose pet-peeve is being left hanging when their pen runs out of ink! The pen comes with a removable ink converter so you can easily install the extra cartridges or a bottled ink of your choice. The black velvet drawstring pouch with yellow-gold color accents also guarantee safekeeping for your pen, especially when traveling. This set includes a Jinhao X450 black ink fountain pen, a black velvet sleeve, and 10 black ink cartridges. The pen has a removable ink converter so you can choose to install a bottle ink of your choice. Be it for daily handwriting or calligraphy, this set lays out the basic essentials you'll need. It's a perfect gift idea as well! Great for people who are always on-the-go and want their pen to always be in pristine condition! 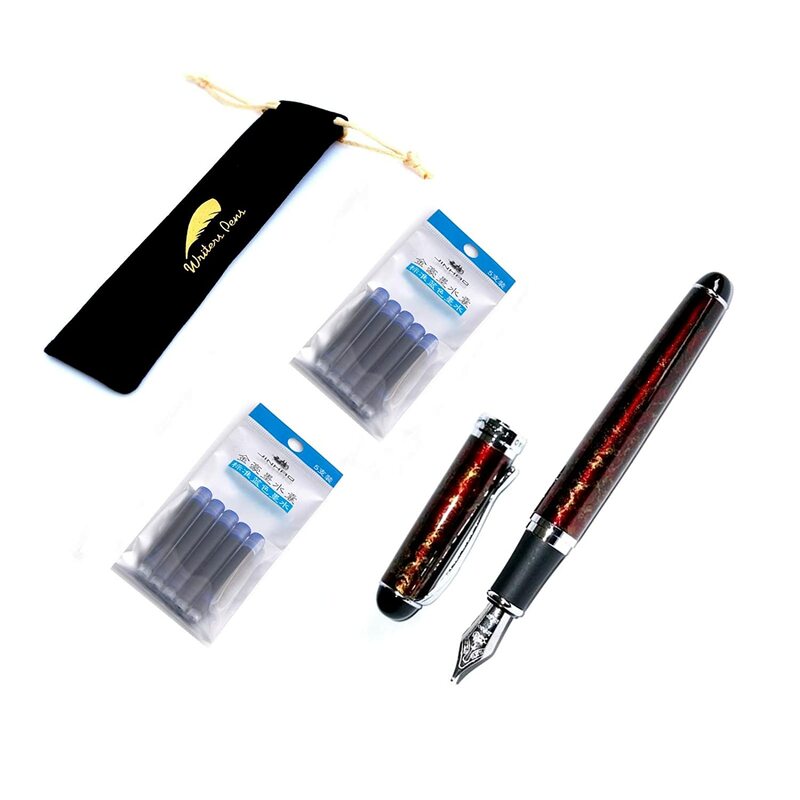 The pen comes with a removable ink converter so you can easily install a bottled ink of your choice. The black velvet drawstring pouch with yellow-gold color accents also guarantee safekeeping for your pen, especially when traveling. A perfect set for someone who's both a reader and a writer. The fountain pen is designed with a medium nib for smooth writing, and a removable ink converter inside so you can install your own bottled ink or cartridge. It comes with a handy card stock bookmark for additional inspiration. A perfect set for someone who's both a reader and a writer. The fountain pen is designed with a fine hooded nib for smooth writing; and a removable ink converter inside so you can install your own bottled ink or cartridge. It comes with a handy card stock bookmark for additional inspiration. Make your writing, drawing, sketching, or drafting more efficient and convenient! This eraser is made from premium quality rubber that won't wear or tear paper surfaces. It features a unique beveled shape and sharp corners, making it easier to handle and ideal for accurate erasures. Handy size measuring 1.5" x 0.75" x 0.4"
Make your writing, drawing, sketching, or drafting more efficient and convenient! These erasers are made from premium quality rubber that won't wear or tear paper surfaces. They feature a unique beveled shape and sharp corners, making each one easier to handle and ideal for accurate erasures. Writers Pens Ballpoint Pen Black Gift Box - 6.75" x 2" x 0.8"
Slip a Writers Pens fountain pen or another pen of your choice inside this Ballpoint Pen Black Gift Box. It features a cardboard material with a matte black finish that's subtle yet stylish. It also comes with a padded black velvet cushion and a white satin ribbon to secure the pen in place. Protect and secure your favorite pen in place using this handy sleeve! It's made from a premium velvety material that's durable and long-lasting in quality. Now you can have a designated place for your ballpoint pen, mechanical pencil, fountain pen, lead pencil, fountain pen, tablet stylus, and more! Get your pen a storage companion using this handy and protective sleeve! It's made from a premium velvety material that's durable and long-lasting in quality. Now you can have a designated place for your ballpoint pen, mechanical pencil, fountain pen, lead pencil, fountain pen, tablet stylus, and more. Our DIY pen holder is made from a soft yet thick felt material. Its durable quality makes it perfect for long-lasting use. The charcoal grey color is simple yet stylish enough to complement your home or office's interior and decor. It also features an intuitive design and has simple-to-follow instructions for easy assembly. Needle and cotton are not included. Keep the imagination going with this inspirational bookmark that will encourage creatives to READ and WRITE. Made from a tough paper stock material that's durable and won't easily rip and tear. It's pre-packaged with a transparent sleeve that makes it ideal for direct gift-giving right after you purchase. No more need to use old receipts or fold over pages when reading! Measures 5.75" x 2". Ideal size for all books.